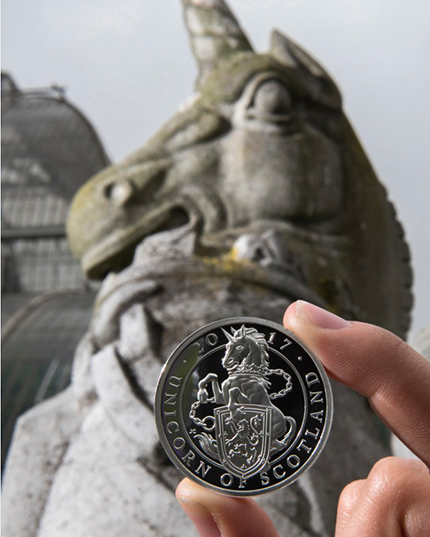 Silver 10-pound Proof coin.In the background, the unicorn in the Queen’s Beasts menagerie at Palm House Terrace, Kew Gardens (photo by Sarah Ross). The Royal Mint have launched (5th June) their latest coin in their hugely successful “Queen’s Beasts” bullion and collector-coin series. 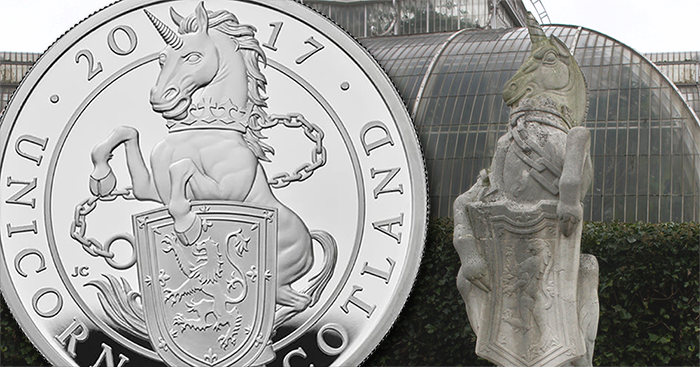 The legendary Unicorn of Scotland is the latest beast to make an appearance onto a range of collectable coins celebrating the 10 “Queen’s Beasts” of British heraldry. James VI of Scotland became James I of England after he succeeded the childless Elizabeth I in 1603, thus uniting the thrones for the first time. The new king took the Lion of England and one of the Scottish unicorns as supporters for the Royal Arms, and they have remained in place ever since. 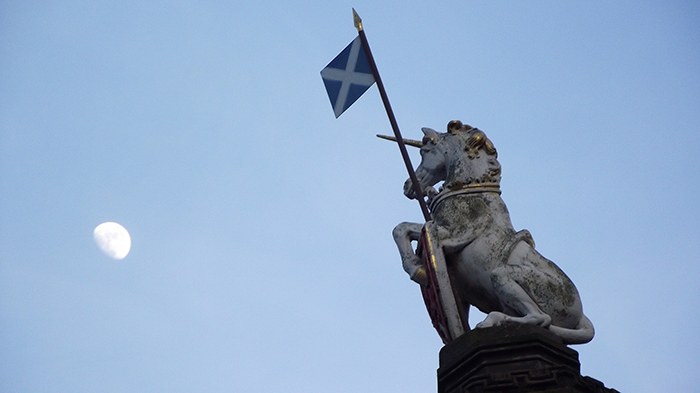 The origin of the unicorn as a regular supporter of the Scottish arms is unknown, but since the 15th century it has been associated with Scotland, where it was struck on gold coins called “unicorns” for their design of a unicorn supporting the Scottish shield. The Unicorn of Scotland, milky-white in colour with golden hooves, horn, and mane, has always had a coronet around its neck like a collar, with a gold chain attached. It’s thought that the chains were to show a great beast tamed to serve the king. Certainly, as with most chained beasts in heraldry, its strength is emphasised rather than diminished by the shackles. 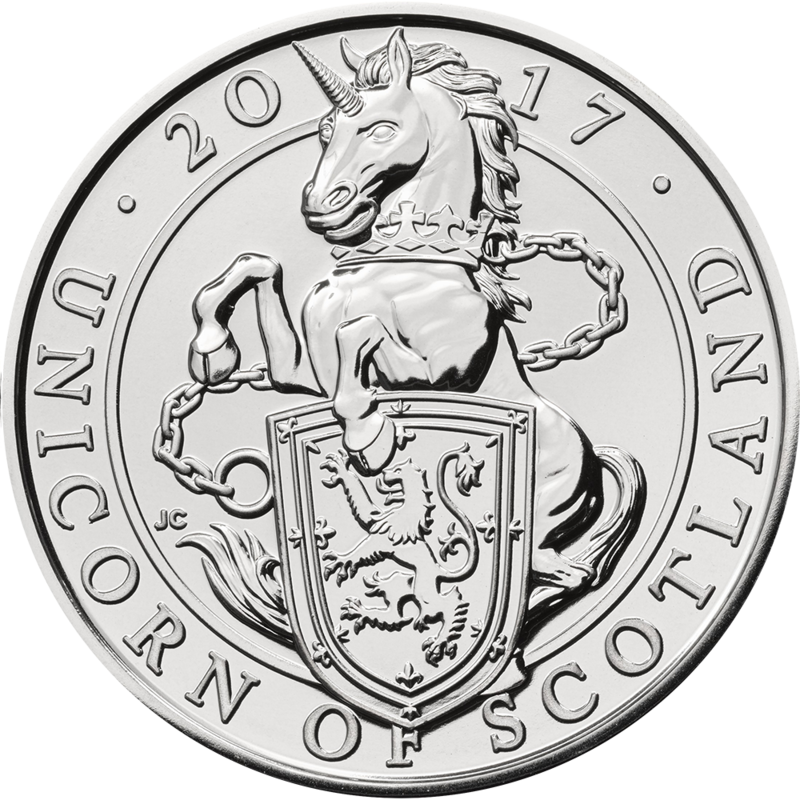 The unicorn holds the royal coat of Scotland, with a red lion rampant (the most fierce stance) on a gold background, which has been unchanged since Alexander III. Today, the beasts and both real and mythical—including griffins, lions, dragons, and falcons, which have stood guard throughout hundreds of years of British royal heraldry—can be seen all around the Queen’s realm in some surprisingly ordinary places in the daily lives of Britons, from pub signs to passports and city badges to sport. Cupro-nickel 5-pound reverse (hover to zoom). The reverse designs are based upon the extraordinary sculptures created by renowned sculptor James Woodford (1893–1976) for the coronation ceremony of Her Majesty Queen Elizabeth II, held in Westminster Abbey in 1953. They magnificently symbolised the various strands of royal ancestry brought together in a young woman about to be crowned queen in a ceremony which derives its origins down through the centuries. The originals are today found at the Canadian Museum of History in Quebec, while a set of Portland-stone replicas, also carved by James Woodford, are at the Palm House Terrace at Kew Gardens. The designs appearing on the reverses of the new coins were created by Royal Mint coin designer and engraver Jody Clark—best known for his “fifth portrait” of the Queen on U.K. coinage—and were inspired by the Queen’s Beasts sculptures by James Woodford. 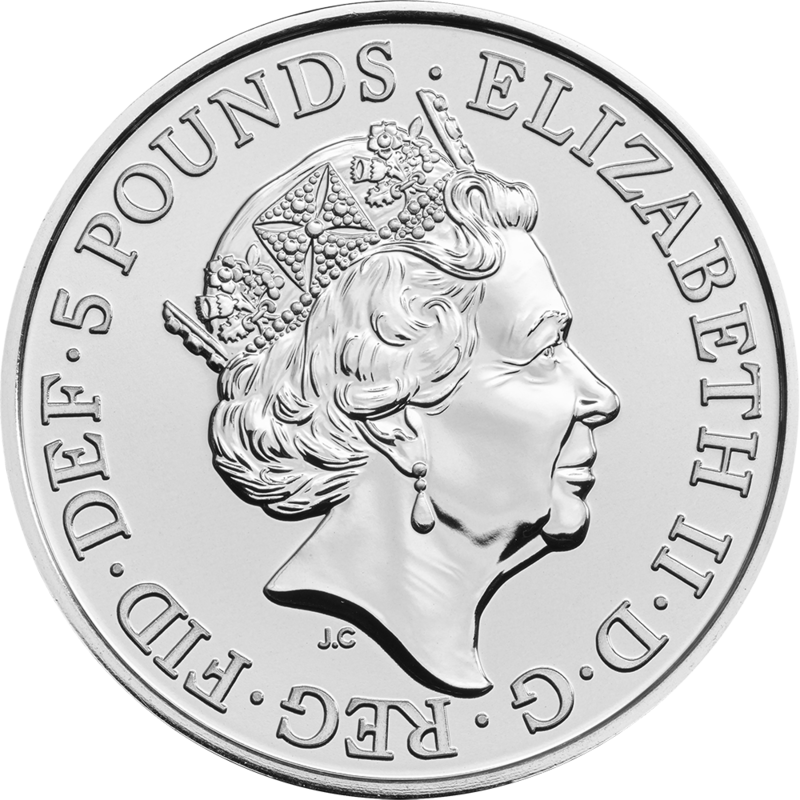 Jody’s effigy of the Queen is seen on the obverse along with the denomination and the year of issue, 2017. The Queen’s Beasts will now be issued in commemorative coin form, launched one beast at a time. The coins are available in a range of finishes, from mint-condition Brilliant Uncirculated cupro-nickel to Proof editions in silver and gold, struck from 1-ounce to 1-kilo sizes. Bullion and collector coins from the Queen’s Beasts series can also be purchased from Whitman sponsor APMEX. PERMISSION PLEASE TO REPRINT THIS (4TH BEAST) PIECE FOR THE NUMISMATIC SOCIETY OF AUCKLAND, NZ. ?